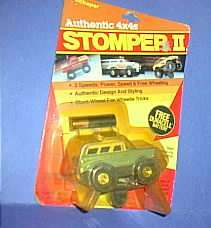 Generation II stompers are still Schaper stompers, but they underwent a redesign, as did the packaging, for the the 1983 toy year. They had 3 settings: off, low (for climbing), and high (for speed) (see pic, notice the sliding bar in the middle that controls the speed). Gen II had rubber tires that were about 1/2" wide. The bumpers were moved to the cover instead of the base. ( see pics of misc stompers ). 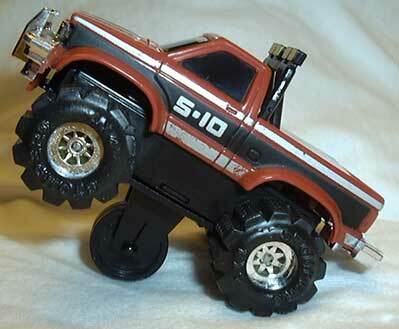 Some Gen IIs came with stunt wheels which was a fifth wheel that attached to the bottom of the stomper so it could drive on only two other wheels. 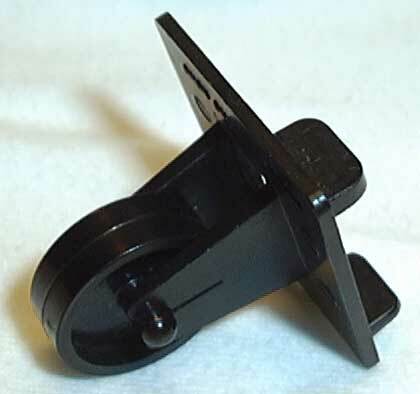 Click here for a Gen II with stunt wheel attached, and here is a stunt wheel closeup. Work x 4's came back for Gen II, but now they are on the new modified platform. Both Generations included a dump truck and a cement mixer, I'm not sure if the others are in both sets. Wilderness Campers came out in 1983, each of the 3 models could come with an optional small trailer. In 1984, it was expanded to 5 models, each with two different colors. A real working winch was added and the trailers became standard, so the name was changed to Workhorses. The Road Rods of 1983 included a Porsche, a VW Bug, a Subaru Brat, a Bronco, a truck, and a chevy van. In 1984, Schaper took it up a notch and created the Custom Kit and the Deluxe Custom Kit. The kit includes one base, 2 bodies, and 3 sets of tires (deluxe is basically doubled this, except one motor is standard and the other motor is high powered). Both the van and the truck disappeared in this 1984 release. Don't forget the mobile force which was introduced in 1983. 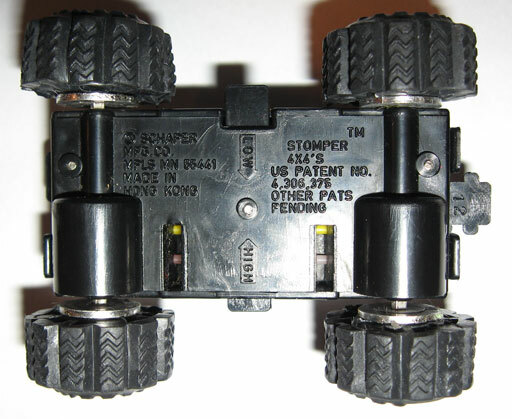 There was also a set of mini stompers that were about half as long and took a single AAA battery. 1983 also saw the introduction of the Heavy Haulers. They are based on the Semi platform, so that means they are 10 wheel drive stompers that required 2 AAs. Stomper Semis became Stomper "Road Kings" Semis. We even saw the introduction of Water Demons! in 1983. This was a set of six amphibious vehicles. 1984 brought us the Dragsters. Like the rip cord powered SSC Super Cycles, the dragsters had little in common with their Stomper brothers. 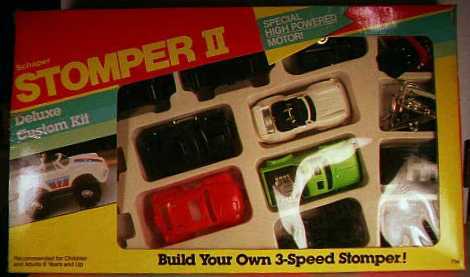 The stompers were slightly modified for a series called Speedsters in 1985. The tires were flat and a steering mechanism was added so that they could follow "Twistrack".